Kites are flying. Gever is flying. Teal is flying. 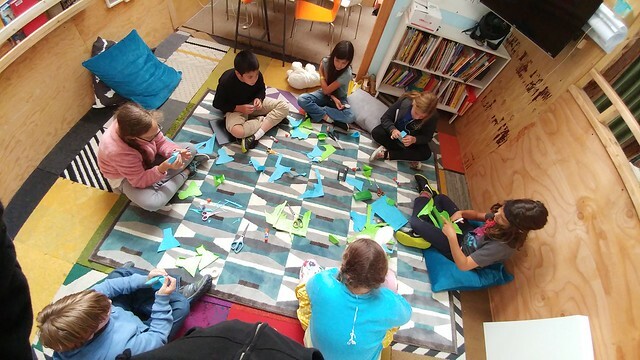 This week the Teal Band set out to build and fly a tetrahedral kite, and along the way, learn some math, read some books, watch the man who started their school “fly,” and do some writing to contribute to this blog. 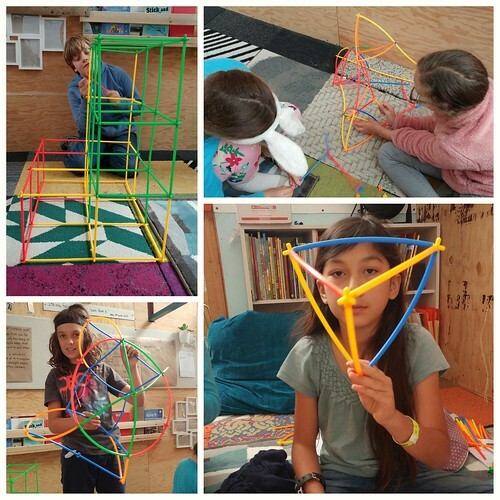 The Teal Band began learning about tetrahedrons by building them out of paper and solving a puzzle. We explored a number of kite shapes. We ended up deciding to build a tetrahedral kite together as a band. It required the band to construct a series of tetrahedrons. 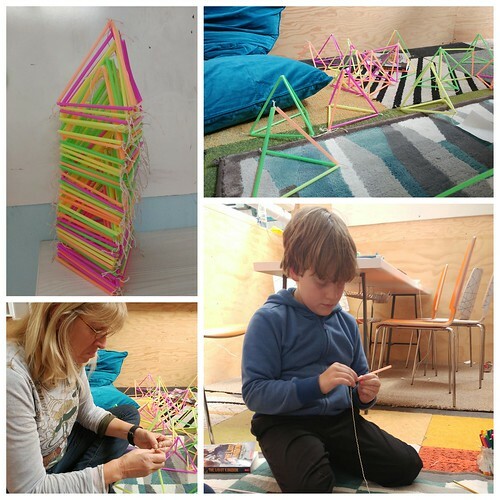 Patrick explained the process of building it: You can make one by making a tetrahedron out of straws then you put a layer of tissue paper over 2 of the sides. Next you put 3 of those in a triangle, and then put the fourth on top so the corners are touching. Ta-da! One tetrahedral kite! You can take four of these bigger ones and build an even bigger tetrahedron and so on and on. 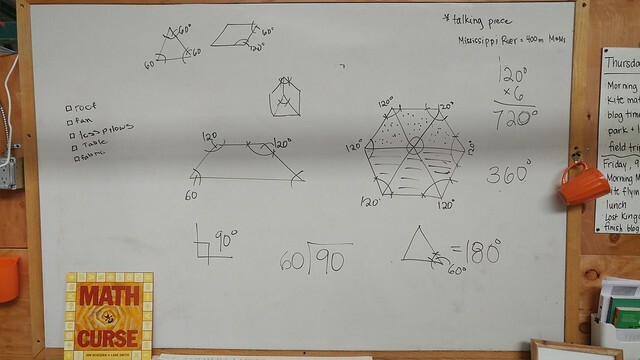 To make sure we would have enough tetrahedrons for our kite and enough straws and string to build them, we completed a number of calculations. We found we needed 64 tetrahedrons, made up of 384 straws and at least 3200 inches of string. The amazing part was that this didn’t phase the team of kite builders, instead it pushed the crew to work even harder. We constructed 64 tetrahedrons out of straws and string. It all started with the book Math Curse. 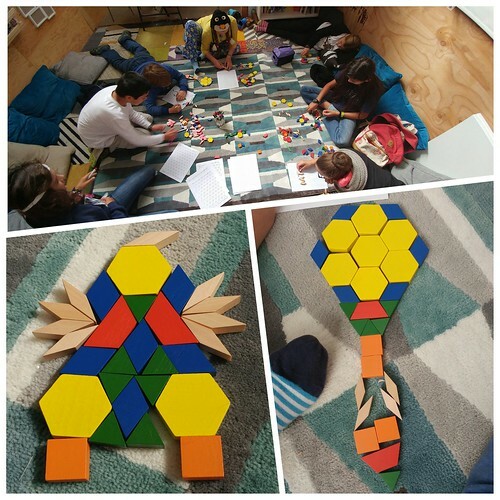 Exploring angles and fractions in geometry with pattern blocks. Aurora became our master kite flyer, testing out multiple ways to keep it in the air. She found that giving the string a “tug” now and then helped get it back up into the air if it began falling. She successfully taught a number of others how to fly it and was a great cheerleader for everyone who tried. Aurora, Piper and Selina patiently pieced the kite together and even let those from other bands fly it. 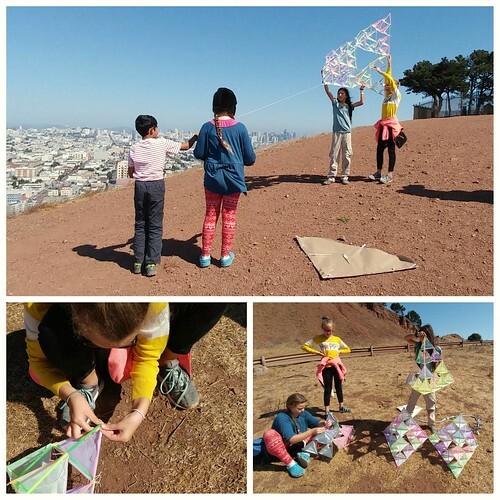 This was a week of not only building a kite that actually flew or learning more about geometry and fractions, but it was a week that really focused on being a team. The Teal Band didn’t end up with seven separate kites. They ended up with one kite that was truly successful because all seven band members had worked together to build it. 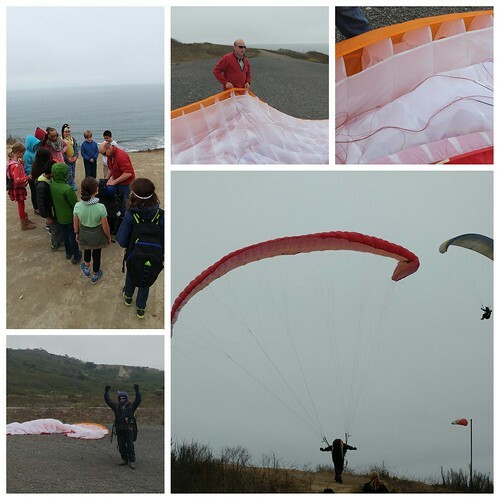 This entry was posted in Teal Band and tagged Alexander Graham Bell, angles, arc:Air, Exploration, geometry, kites, Math Curse, Mussel Rock, paragliding, Teal Band, tetrahedral kite, tetrahedrons, wind tunnel. Bookmark the permalink.